In what proved to be a very light campaign Enable still comes out on top as the best horse in training in 2018 for me. John Gosden’s mare wasn’t seen until September where she put in a fantastic display to beat stablemate Crystal Ocean at Kempton. This proved to be a perfect stepping stone for back to back Prix de l’Arc De Triomphe at Longchamp, where Enable emulated fellow mare Treve by holding on late from a fast finishing Sea Of Class. The upside of not seeing Enable until late in the season was that John Gosden was able to charter a route for an end of season swansong at the Breeders’ Cup at Churchill Downs. Frankie Detorri always looked in control and ultimately Enable ran out a snug winner of the Breeders’ Cup Turf. There is no doubt that Enable is one of the best racehorses we have seen in many a year and thankfully it was announced back in November that she will stay in training for a historic hat-trick bid in the Arc. Jessica Harrington’s grey mare started her career by winning a brace of races at Naas and was sent off the hot favourite in the Albany only to be denied by the French outsider Different League. She ended her juvenile campaign with a below-par run in the Moyglare on her first try at Group 1 level. Alpha Centauri began her three-year-old campaign with a very lacklustre run in the 1000 Guineas trial at Leopardstown in April but this was easily explained afterwards, as it became apparent that good ground was a necessity for the daughter of Mastercraftsman to excel. By the time Alpha Centauri lined up in the Irish 1000 Guineas she was a little considered 12/1 shot but she ran out a cosy winner under Colm O’Donoghue. Jessie has shown time and time again that she is a dab hand when it comes to training under both codes and victories in the Coronation, Falmouth and Jacques Le Marois Stakes all followed in what proved to be a very fruitful summer campaign. She rounded off the year with a close runner-up finish to Laurens in the Matron Stakes on Irish Champions Weekend. It later transpired that Europe’s top-rated three-year-old filly had chipped her fetlock joint during the race and had been retired which was disappointing for all concerned but she, without doubt, had a fabulous 2018 campaign and lit up many a racecourse. Oisin Murphy was the star jockey during 2018 and it was John Gosden’s Roaring Lion that played a crucial role in propelling the profile of the young Irish-native. He ran four times as a two-year-old, winning on the first three of these occasions and then only going down by a neck to Saxon Warrior in the Racing Post Trophy. The Craven Stakes was his first port of call in his three-year-old campaign where he looked quite flat to finish a well-beaten third behind future Derby winner Masar. Connections keep the faith and went straight to the 2000 Guineas where he again had to settle for a minor role, with Saxon Warrior again proving his superior. John Gosden stepped the son of Kitten’s Joy up in trip for the Dante where he ran out a very impressive winner. That Dante run looked to have primed Roaring Lion for a crack at the Derby where he ran a fine race but ultimately his stamina ran out. A drop back in trip sparked further improvement within him and victories in the Coral-Eclipse, Juddmonte International, Irish Champion Stakes, QEII Stakes came between July and October. This incredible string of wins made Roaring Lion one of the most popular falt horses in training last year. There was disappointment on his last start of the campaign at the Breeders’ Cup, where he trailed in last in the Breeders’ Cup Classic, but in truth had probably had enough racing, considering it was his ninth run of the season. In his defence, the “Classic” has been a graveyard for European runners with greats such as Giant’s Causeway, Galileo and Sakhee all coming up short. A career at stud lies in wait now for Roaring Lion, who was named Champion Three-year-old colt and European Horse of the year at the Cartier awards. He will stand at Tweenhills Stud at a fee of £40,000, for those of you interested. Karl Burke has made a name for himself by handling some classy sprinters in recent years namely Quiet Reflection. It was the John Dance owned Laurens that flew the flag for the yard last season with victories in the Group 1 wins in Frane, Ireland and England to her name. In total the daughter of Siyouni won 4 Group 1’s in 2018 and lowered the colours of Alpha Centauri and Happily along the way. Laurens was one of the most consistent mares in training and didn’t probably get the credit she deserved. On her final start of the season, connections stumped up the £70.000 supplementary fee for the QEII Stakes where she faced the aforementioned Roaring Lion. She ran a fine race but wasn’t quite good enough with Dance saying afterwards that the contest was “one race too many for the season” but added that Laurens would probably stay in training as a four-year-old. The Classics tend to define a flat horses career and the same can be said for Cheltenham when it comes to national hunt horses. Bearing that in mind we have included three of last season’s Cheltenham winners, who’ll be bidding for back to back victories this year. Tiger Roll who is bred for a Derby rather than Grand National went into last seasons Cheltenham festival with an already enviable record at the festival with victories in the Triumph Hurdle and National Hunt Cup to his name. Gordon Eliott had the sights firmly on the Cross Country race with many (me included) saying his jumping wasn’t good enough to win the race but he proved the doubters wrong in no uncertain manner to land his third festival victory. That win alone made it a memorable season for Tiger Roll but his greatest day was yet to come at Aintree where he held on from the fast-finishing Pleasent Company to gave his trainer a second Grand National following in the footsteps of Silver Birch in 2007. It would appear a similar route back to Aintree lies ahead and I for one wouldn’t back against this tremendous horse. Since Altior was sent jumping he has yet to taste to defeat, which is a fabulous record considering that was 15 runs ago and 8 of those have been in Grade 1 contests. Nicky Henderson’s charge has won the Supreme, Arkle and Champion Chase at the last three festivals and another Champion Chase looks a distinct possibility. To put it simply Altior is the best 2-mile chaser either side of the Irish Sea and will no doubt be compared to previous great Champion Chase winners such as Moscow Flyer and Sprinter Sacre. If asked which one is better, I couldn’t really say but it likes highly likely that Altior will have the most wins to his name. It’s impossible to speak about the horses that lit up 2018 without mentioning last seasons Gold Cup winner Native River. Colin Tizzard’s charge is one of the most popular horses in training because he wears his heart on his sleeve and doesn’t know the meaning of the word “beaten”. The reigning champion jockey Richard Johnson has built up a great relationship with the horse with the pair really shooting to prominence in the 16/17 season with victories in the Hennessy and Welsh National. Native River was actually only seen twice last season and following a prep run victory in the Denman Chase, he found most up the hill in jump racings blue ribbon event at Prestbury Park. He has been slightly disappointing thus far this season but I’m sure the main aim is back to back Gold Cups. The final horse on the list is Buveur D’air, who’s another seeking a hat-trick of victories at the festival having taken the last two renewals of the Champion Hurdle. Nicky Henderson’s inmate went through last season unbeaten, with his greatest test coming in the Champion where Melon pushed him all the way up the hill. He suffered a shock defeat at the hands of Verdana Blue in the Christmas Hurdle but regained the winning thread in the Contenders Hurdle most recently. Nicky has used this race as a stepping stone for the Champion Hurdle for the last two seasons and he will be tough to beat again this year. 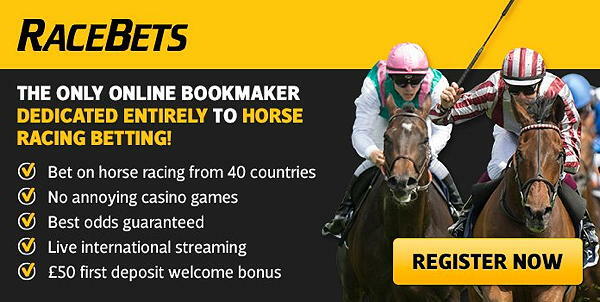 Creating a RaceBets account is quick and easy. You can deposit using Mastercard, Visa, Paypal, Skrill, Neteller or Paysafecard. Claim your welcome bonus, now!